I’m writing this on Sunday since I didn’t finish my knitting till 3am and wanted to show it here. I visited the Scarborough maritime heritage centre today. Each doll is going to be linked to a place that represents the character of the doll and I chose this heritage centre for personal reasons over than popularity. When I asked people to recommend a place that represented Ganseys in Yorkshire I had a lot of suggestions of commercial places in Whitby and Filey. I’m not opposed to linking with a commercial business, in fact the next doll is linked to a shop, but where I can I want to highlight some of the lesser known tourist centres. I chose Scarborough for my own links to the area, it’s where my grandparents lived and I’ve a lot of lovely memories of the town. As I’ve been around the town I’ve also noticed the friendliness of people. I’m staying in the Grand, it’s one of those places you look at as a kid and think it’s only for the posh people. It’s a ‘grand’ building and the staff are wonderful, but the building is not being looked after (my bedroom window was kept shut with gaffer tape). It’s a shame that British seasides often have the reputation they do, but there are signs that Scarborough is fighting back. Looking for toilets yesterday I found the indoor market, it’s not the bustling place I remember, but new artisan businesses are popping up and although perhaps not as much use to the locals as it once was, for tourists it’s a must visit place. The heritage centre has a small shop space but is packed of interesting things to see. The volunteers are extremely knowledgeable and friendly and I had a good chat about Ganseys. One glaring ‘mistake’ Gansey knitters will spot on my Gansey is that it isn’t a Scarborough one, it’s a blend of Scarborough and Whitby styles. The traditional Scarborough top half is more a moss stitch, but I chose to add cables instead as a more interesting pattern. I explained this and was told that the Scarborough Gansey is older and perhaps the reason for the lack of details is that cables hadn’t reached us from Aran. Well, who knows. We chatted about the myths of Ganseys, whether it’s true that the styles of jumpers were to help you be identified and relocated to your fishing village if you drowned at sea. If you read Penelope Hemingway’s book on River Ganseys you might agree with her (and me) that this was a myth. As well as Penelope’s book, I’ve also spoken to the owner of Propagansey who is extremely knowledgable about Ganseys. If you think about the Gansey in a more realistic way, since patterns were not written down at the time, the pattern was passed down through family, as the family married the pattern spread through the village. It wasn’t an identification system, just a local pattern being taught through family generations. But it’s a nice story. I also found out that a black Gansey represented death, so was not a good idea to make whereas White meant you’ve been married less than 5 years. A few years ago I went to the in the loop conference and listened to Annemor Sundbø (https://annemor.com/english/) who studies traditional Norwegian jumpers. A lot of the styles have a similarity to the Gansey in that the bottom half of the pattern is different to the top half. These jumpers have a black and white pattern on the top half and a plain white non patterned bottom half. Annemor suggested it was simply that white wool was less expensive than black wool and since the men tucked the jumpers into their trousers is was a way of using cheaper wool for parts of the jumper not seen. A bit like how my mum used to only iron the front of my dad’s shirts because when he wore his jacket no one saw the un-ironed back! Could this be why some Ganseys are plain on the bottom half? Why put all that effort into the part of the jumper not seen? I also still have a family mystery to solve! Some time ago I found an image in a book, The boats of the Somerset levels by Mike Smylie, I have very little information on my dad’s family so anything helps. The image shows my granddad, beside the river on Salmon parade in Bridgwater, Somerset. He was a salmon fisherman and the last in a line of boat builders. I’ve also found this painting on Bridgwater’s council website. Somewhere I remember reading the painting dated 1902 and shows Pocock boat business on the river, the white cottages on the right of the river were where dad’s family lived. And that is all I have to prove that my dad’s family existed! I was interested in the fishing net used by William Pocock and had searched the internet for information but found only one similar item in a museum in America! I showed the image to the people at the heritage centre, but they’ve never seen one like the one in my grandads image. So I’ve emailed the museum in America and the Blake museum in Bridgwater to see if they have any information. Why? Because despite my lack of woodworking skills I’ve been trying to make a miniature version of the net! And so, with miniatures in mind, I’ve a few last images. I’m making a doll to represent the terrible knitters of Dent, terrible as in, they were terribly good at knitting! With a knitting gauge of 5 stitches per centimetre and 1.5mm needles I set myself up in the hotel coffee lounge to set about making a version on the Dent gloves. There is a good book about dales knitters, recently republished by Penelope Hemingway (https://theknittinggenie.com) which includes a pattern for some Dent gloves. This image of a pair of Dent gloves comes from her blog page and is the pair I took a bit of free licence with! I didn’t manage the fringe at the bottom, although… nah! Too fiddly. I managed a date, which took up a lot of space and some of the pattern. The plan was to make mittens, thinking it would just be crazy to attempt gloves, but as I reached that part of the gloves I thought what the hell! I also only made 1 glove since I wanted the doll to be midway knitting the second one, although I might just make the second one. I’m off to Scarborough tomorrow with the little fisherman doll. Today was a busy day of packing and repacking because I always carry far more than I need with me. I’ve been watching a lot of YouTube videos of travel sketchers and looking at a minimalistic approach to painting and drawing equipment. I watched an online craftsy class by Katherine Ewing called Luminous Watercolour Mixing which uses a six colour palette. Three cool primary colours and three warm primary colours. Its a great palette for producing some brilliant bright colours, which all look great together. I’ve also been looking at more figure painting videos on YouTube. So far all my drawings are similar, simple sketches with little or no colour. I’m hoping to try some different techniques on the beach! I’ve finished two dolls so far, and am now working on the knitter, based on the terrible knitters of dent. I knitted a miniature shawl using 2.25mm circular needles, that’s what I’ve been knitting in church the last few weeks (yep, I Knit in church, but I’ve not yet been struck down!). I knitted the shawl in undyed lace weight wool and dyed it as a finished item. I also dyed some of the lace weight yarn black so I can make some miniature dales gloves. The gloves are similar to Sanquhar gloves, which are knitted fine and take a long time. I’m lucky in that my eyesight, while not being able to recognise people across the room, is perfect for small close up work. 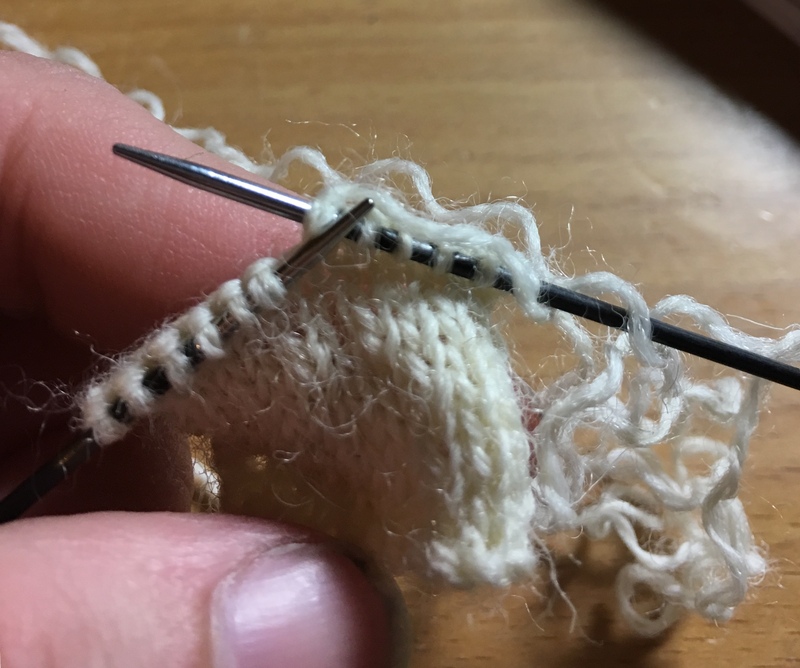 I made a swatch to try and get the right needle size and settled on 1.50mm knitting needles (DPNs) the gauge is 5 stitches per centimetre. So now I just have to hand Knit a miniature pair of gloves, easy right? However, since my dolls don’t have fingers I had to decide whether to go with tradition and make gloves (imagine the mini fingers) or to make something that would fit on the dolls hands. I’m thinking practicality over tradition, so I’m hoping to manage mittens. It’s these little details that makes the plan of 8 dolls more unlikely. I woke up a few days ago thinking that perhaps I could make a folk musician complete with accordion! It was at that point that I decided I was my own worst enemy and my attention to detail would become the death of me. Been working on this outfit for a couple of days. It’s a Christening dress made from cotton thread, size 1.75mm hook. It’s not sewn or glued to the doll as most dolls house dolls are, but the dress is removable by undoing the tiny button on the back of the dress and the bonnet is tied on. There’s even a trim on the back of the bonnet. Anyway, it’s not yet on Etsy, been on Ebay but no takers. If you’re interested let me know.